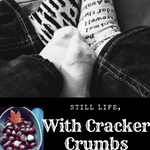 Erin @ Cracker Crumb Life | Still Life, With Cracker Crumbs..
Hi all!! Happy belated Easter if you celebrate and Happy Earth Day! I hope you all had a great weekend! Friday we had dinner at my brother’s house where we had a blast, hanging out and chatting while our kids were just being kids around us, the way it should be. Then yesterday we took a family hike by the lake, spotted lots of water birds, and then went for Easter dinner at my cousin’s house. She went out of her way to make a fun Easter for my son and niece. Her kids are grown, but my cousin put Easter Eggs all over the yard for the kids to find, and Wyatt loved it! My niece wasn’t able to make it, so Wyatt got all the treasures! It was a great weekend! I am finally feeling myself. All last week I was a bit a run down and gross, my allergies were acting up like crazy, and I just wasn’t me. I had no get up and go, and to top it off, I was in a bit of a reading slump. I finally settled in with the perfect book though, and it is one one of my favorite reads so far this year. So from the slump I emerged with a new book to rave over! In my slump, I picked this book up off of my bedside pile, and was immediately drawn into this micro world. This little books is a calm, gentle, beautiful read, one that speaks of perseverance and appreciating life. I completely loved it. Look for post hopefully this week! I have been horrible about following my reading plans this month. Things just aren’t sticking. This week I am going to read my book club book Bohemian for sure, and then I’m going to read Bonavere Howl. Here’s to hoping I can stick to my plan! How about you guys? Did you have a nice weekend? What’s going on in your neighborhood? Any plans for Earth Day? We are all about nature at our house. We love to be in it, we love to celebrate it, we love to read about it. It is very important to me that Wyatt loves the earth and the outdoors as much as we do, and by exposing him to it through being outside, cherishing all our creatures great and small, and learning by reading as well, we can nourish that ingrained sense of love toward our world and all of its inhabitants. I have a few books that I have put aside just for Earth Day next week – some are old favorites, some are new to us. And here they are, one for each day next week and then a bonus one for fun! The Earth Book – This one has been in rotation here for a while! Wyatt loves it, so do I. It’s a quick easy read, and has great colorful illustrations. Me… Jane– This is a great read for kids, to introduce them to Jane Goodall- and to show them that a dream you have as a kid can become reality! We read this one together surrounded by every monkey toy that Wyatt has. Blackout – This one is a favorite of mine. It is about a citywide blackout that causes families to leave their technology behind and venture out into the community. I love it to pieces and is a good book to use to talk about energy conservation and time without tech. Fancy Nancy Every Day is Earth Day – It is important to me to make Wyatt aware that our choices for a better planet are an every day thing, not just on earth day! Biscuit’s Earth Day Celebration – I thought this was a cute look at a few things kids can do to participate in keeping our planet alive and healthy. It’s Earth Day! – I love Mercer Mayer! Little Critter was a favorite of mine as a kid and I can’t wait to read this one with Wyatt. This is a new one to both of us! The Lorax – No list about Earth Day books would be complete without the Lorax…I think we might make some truffula trees even! Bug Hotel – My son loves bugs. We bought a bug house last year but this year I want to really expand on it and do a few other things as well. And a few books for you! What about you? Do you have any good earth day/environmental reading suggestions? I would love to hear them! Hi everyone!! My week was a bit hectic, playing catch up from spring break plus some family things going on as well. This weekend though we took a walk in the woods and saw so many signs of spring, including a little frog we spotted that was peeping out at us. We also celebrated my niece’s birthday today. She is such a little glamour girl already at two, walking around with her toy phone and toy lipstick, adorned in her sparkly shiny necklace and bracelet. Plus, there was cannoli cake! I still didn’t end up reading Finale! I am not as great at reading on my Kindle although I am trying to be better about it, for many reasons. However, I did read this review book and I couldn’t stop reading it! I picked it up one afternoon and had it finished by the next day, which four years ago wasn’t a big deal, but now is a huge sign I loved a book. Review coming soon! I will probably be reading from these three over this week. I can’t quite land on a book fully it seems lately! Not too much. We spent the week running about and by the time evening rolled around we were wiped out! When we did have a second to take a break and watch tv, we just watched whatever was on HGTV. So what about you guys? What all is going on in your neighborhood?